Sun-n-Sand Motor Hotel, 401 N. Lamar Street, Jackson, Mississippi. TWX: JN 263. Phone FL-4-2501. The downtown Sun-N-Sand features a heated swimming pool and the finest guest room accomodations, with banquet, meeting and convention rooms. Located in the heart of downtown Jackson. That glazed three-story cube at left makes me weep—with joy. And those groovy chaises longues and side tables are pretty devastating too. What optimism and gladness the midcen tendered! My children grew up thinking the word vacation was synonymous with the “Sun n Sand”! Fun-filled days! I was by there a few weeks ago for the first time–sad and forlorn surrounded by chain link. I stayed there the first night that I moved to Jackson! Stayed that night (Sunday night) then moved into my apartment the next day. I think the Sun and Sand Motor Hotel had an additional unit across Henry Street to the north. I think that is the unit that I stayed in. The area with the newer (darker) pavement across Henry St. to the north of the Sun and Sand is where I think the other unit was. See Google Map link. Mr. Rippy, the property to the north of the old Sun n Sand motel was formerly The Patio Club. It may have been owned by the SnS, I don’t know, but I don’t remember there being any hotel rooms in it. The handful of times I was in it years back, it was always for some sort of “function” involving legislators and people trying to lobby them on one purpose or another. One reference I found to it was the “Patio Club, an old lobbying water hole where drinks were consumed and deals were done by legislators and lobbyists, ostensibly on behalf of the Mississippi electorate. It worked out well because many of the out of town office holders lived at the Sun ‘N Sand during the legislative session.” It is now state-owned property known as the BareField Complex and has housed some agencies in the past, but now seems to be empty. I saw reference elsewhere to the Patio Club as being a private club owned by Mr. Barefield of Barefield Office Furniture, so the current name makes sense. Apparently there was some sort of “patio club” at the King Edward, so maybe when that closed in the 1960’s Mr. Barefield built the new Patio Club on Lamar Street. I’m no architect, but would guess the age of the building would be about right for that. 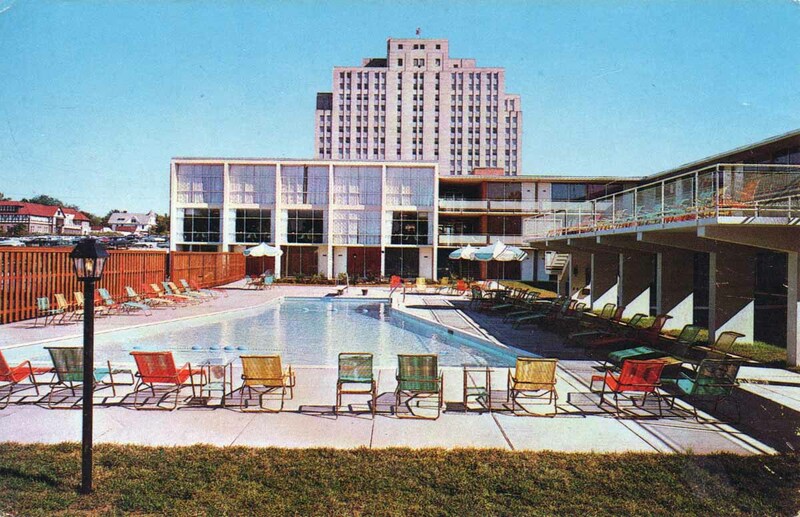 In 1958, the new Patio Club was built by the King Edward. They purchased the State Theatre property adjacent to the hotel and built the private dinner club, Olympic-sized swimming pool that hotel guests could use, health club with spa and masseuses for men and women, and new convention hall on Capitol Street. A group of Jackson restaurateurs sought an injunction in 1962 against the Patio Club (and other private dinner clubs) for serving liquor, calling for the prohibition law to be enforced or abolished. The first reference I found connecting the Patio Club with the address on Lamar was in 1968, with a reference to the “new establishment.” The Patio Club at 455 N. Lamar was the second most popular spot for lobbyists in 1985 where they reported spending $9,000. The Sun ‘n Sand was last at a mere $3,445. The Patio issued a statement of intent to dissolve in 1985 also. In an ironic note, in 1990 after it became the Barefield, two months after moving in, the environmental lawyers for the Attorney General’s office moved out after learning the asbestos was discovered during removal of the ceiling of the former Patio Club on the first floor. The owner of the building which had recently leased space to the AG office reportedly said the building was safe and that the AG staff overreacted.